It is popular to restore gardens with heirloom flower bulbs that may have been included in one’s grandparents' gardens. The varieties of heirloom flower bulbs included in this listing are all dated in the 1950s or earlier and are grown commercially in the Netherlands and considered to be horticulturally viable. We recommend ordering early to reserve your favorite varieties. Our Fall catalog is mailed at the end of May each year, and we start to reserve orders in mid-May once our collection and pricing are finalized. Our collection includes special, rare varieties of Tulips that may be grown by just one nursery in the Netherlands. It is wise to reserve these well in advance of the fall shipping season to make sure you can secure exactly what you want. This is particularly important for new varieties or those marked limited supply. We don’t charge credit cards until we prepare orders for fall shipment, so there is no cost associated with reserving your favorites in advance. You can always add to it or change it before we ship if you want to. If any of your personal favorites are sold out or unavailable for horticultural reasons, just give us a call. We do not ever make automatic substitutions. We would be happy to suggest good alternate varieties for your consideration. The general rule of thumb for deciding how many Tulip bulbs you need for each planting site is to plant four bulbs per square foot, spaced about 6" apart, and 6" to 8" deep. But there are Tulips that make a smaller top size bulb that should be planted at the rate of about nine bulbs per square foot: Species Tulips. The square footage of a planting site is determined by multiplying the width by the length. For example, a bed that is 5' wide and 20' long would be 100 square feet, for which one would need 400 Tulip bulbs. If there is other plant material in the planting site, you can estimate the space involved and decrease the square footage proportionately. No matter how well we ourselves estimate the number of bulbs required for a particular planting site, we always manage to run out and need more. If this happens to you too, just call us and we will ship more out to you as soon as humanly possible: usually the same day, if you call by noon. 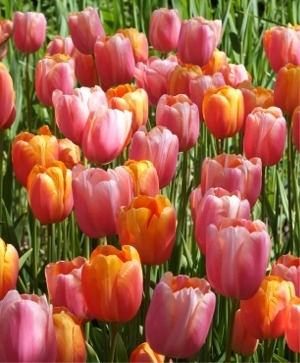 We carry 280 different varieties of Tulips and Tulip mixtures. We organize our huge selection of Tulips by cultivar group classification: the following 15 groups as defined by the Royal General Bulbgrowers’ Association, the "KAVB", in the Netherlands. Single flowered cultivars, mainly short stemmed and early flowering. Double flowered cultivars, mainly short stemmed and early flowering. Single flowered cultivars, stem of medium length, mid season flowering. Originally the result of hybridization between cultivars of the Single Early Group and the Single Late Group. Single flowered cultivars, long stemmed, mid season flowering. 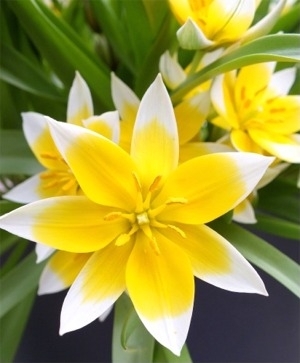 Originally the result of hybridization between cultivars of the Darwin Group with Tulipa fosteriana and the result of hybridization between other cultivars and botanical tulips, which have the same habit and in which the wild plant is not evident. Single flowered cultivars, mainly long stemmed, late flowering. This group includes e.g. the former Darwin Group and Cottage Group. Single flowered cultivars, mid season or late flowering, flowers with pointed reflexed tepals. Stem of variable length. Single flowered cultivars, tepals are edged with crystal-shaped fringes, mid season or late flowering. Stem of variable length. Single flowered cultivars with partly greenish tepals. Late flowering. Stem of variable length. Parrot Group: Single flowered cultivars with laciniate, curled and twisted tepals. Mainly late flowering. Stem of variable length. Double flowered cultivars. Late flowering. Mainly long stemmed. Tulipa kaufmanniana with her cultivars, subspecies, varieties and hybrids, which resemble T. kaufmanniana. Very early flowering, sometimes with mottled foliage. Flower with multicoloured base opens fully. Exterior normally with a clear carmine blush. Height up to 20 cm. Tulipa fosteriana with her cultivars, subspecies, varieties and hybrids, which resemble T. fosteriana. Early flowering, leaves very broad, green or grey green, sometimes mottled or striped. Stem medium to long. Large long flower, base variable. Tulipa greigii with her cultivars, subspecies, varieties and hybrids, which resemble T. greigii. Mostly with mottled or striped foliage, flowering later than kaufmanniana. Leaves spreading normally on the ground, mostly strongly undulated. Flower shape variable. In fact not a cultivar group, but the collection of all species, varieties and their cultivars in which the wild species is evident, not belonging to any of the above mentioned cultivar groups. Apart from color, height, form and design considerations, one must also consider the horticultural zone hardiness of their Tulip selections. If you have received our catalog, your horticultural zone is detailed above your address on the back cover of the catalog, and within the billing name and address box on the order form located in the middle of the catalog. As a rule, most Tulips are good for horticultural zones 3 through 7. Yet as with most rules, there are many exceptions. For example, Parrot Tulips are only good from horticultural zones 4 through 7, while Single Late Tulips are good from horticultural zones 3 through 8. Species Tulips are all over the place. Tulipa acuminata loves horticultural zones 3 through 9, while Tulipa saxatilis is good for horticultural zones 5 through 10. 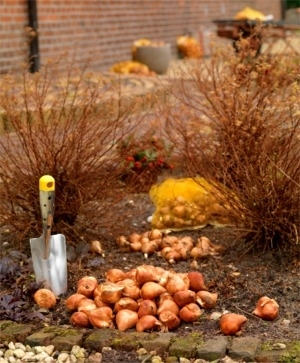 If you want to experiment with a variety that is marginally good for your colder micro-climate, plant the bulbs in a protected spot, like near your home’s foundation where they may benefit from a bit of radiant warmth, and consider applying a two-inch layer of mulch to the bed after the surface of the ground freezes. This will help protect the bulbs from temperature spiking. Good mulching mediums include straw, salt marsh hay or oak leaves. 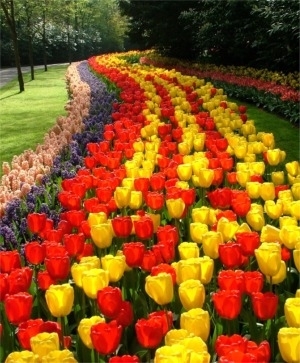 Most Tulip bulbs perform well through horticultural zone 7 when planted in outdoor garden beds or in naturalized drifts. 99% of the time, Tulip bulbs planted in exterior containers, window boxes or raised beds will not thrive due to temperature spiking. Temperature spiking prevents mature root growth which, in turn, results in random or stunted foliage and few if any flowers. Not good. 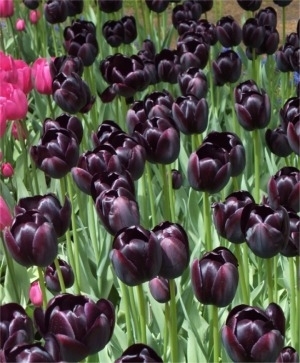 We carry the largest top-size bulbs that each Tulip variety is capable of producing. 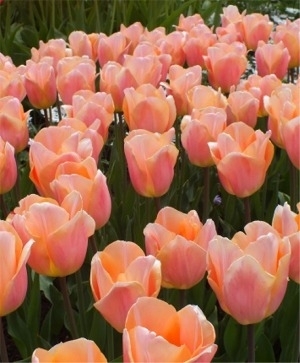 Most varieties of Tulips create top size bulbs that are 12 centimeters and up in circumference: the measurement around the widest girth of the bulb. When you receive your order, you may notice that some bulbs are larger than others. Rest assured that each are at least 12 centimeters in circumference: some may well be larger: kind of like a bulb bonus. 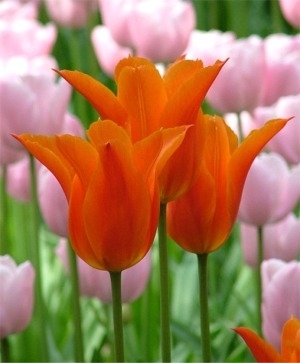 Species Tulips are a class that often makes the largest top size bulb smaller than 12 centimeters in circumference. 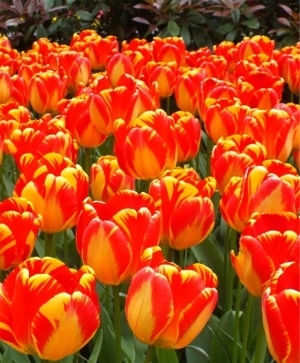 In fact, the largest bulb size of most Species Tulips is usually just 5 to 6 centimeters in circumference! 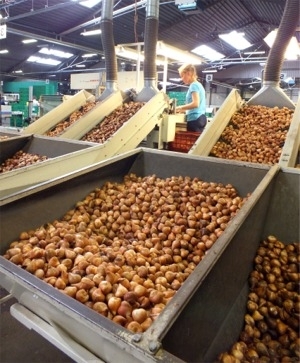 In the Netherlands after harvest, flower bulbs are sized on conveyor belts with holes just ever so slightly smaller than the top size. All of the smaller bulbs drop through, and only the top size bulbs are retained. This is why some bulbs may be larger than others. All bulb sizes are detailed in our catalog and online. If any variety grows a top size bulb that is smaller than anticipated, we note it on our website. Some Tulip bulbs may have little tiny baby bulbs attached to them. These are known as bulblets or offshoots. They need not be broken off from the mother bulb prior to planting. If they break off, plant them at the same depth and space apart as the mother bulb. When you choose to secure your Tulip bulbs from John Scheepers or Van Engelen, you will receive the most healthy, top-size bulbs available from the annual Dutch harvest. Size does matter with flower bulbs as does the manner in which they are shipped from the Netherlands and cared for prior to their shipment to you. The biggest investment in one’s garden is the time spent in planting, and in the hope and expectancy for magnificent spring performances. It’s best to plant the best. In the fall, we will ship your order to you so that you may plant your Tulip bulbs at the proper time for your horticultural zone. 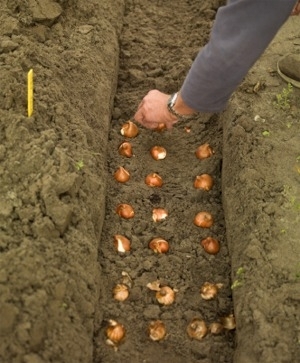 Prior to planting, open all exterior and interior boxes and inspect your Tulip bulbs. In days of old, Tulips used to be planted by hand, and harvested by hand. Over time, an entire industry of computerized machinery has developed that enables flower bulbs to be planted, watered, fertilized and harvested, washed and sorted by machine. After these processes, the papery sheath encasing the Tulip bulb may or may not be intact or in place: this has no bearing on the vitality or performance of the bulb. Some bulbs may have nicks or scars from the mechanical harvest and cleaning processes. These are normal and do not affect the bulb’s performance. A firm bulb is a viable bulb. Other bulbs may have a gray-blue "transportation" mold on them. You may remove it with a paper towel or put the bulbs in a single layer in the sun for an afternoon. 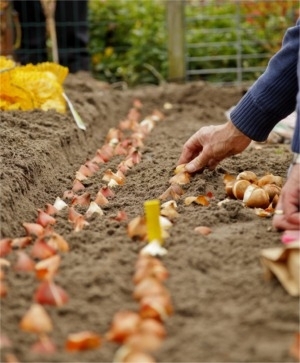 Once the bulbs are planted, the soil wicks moisture away from the bulbs and the mold will disappear. But if a Tulip bulb has a soft spot, please inform us as soon as possible so that we may provide you with a credit or a replacement. 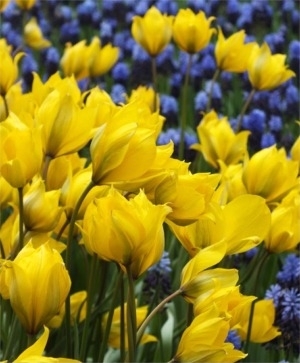 Some bulbs, particularly Giant Darwin Hybrid Tulips, exude a natural sap like substance. 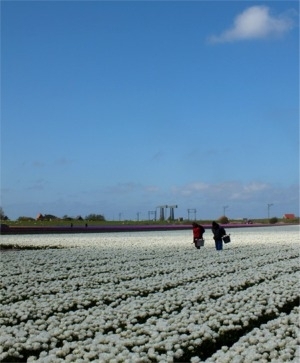 Our flower bulb growers and Dutch and American agricultural inspectors fastidiously inspect the Tulip fields while the bulbs are in bloom. They walk up and down the long fields, day after day, to make sure that the bulbs are healthy, virus- and fungus-free and true to name. Our Dutch export colleagues similarly inspect the bulbs for size and health before counting them and packaging them for us. When we receive them into our warehouse after their two week+ journey across the Atlantic Ocean in humidity and temperature-controlled containers, we inspect them again. We spot check each variety on a weekly basis over the course of the fall season to make sure that the bulbs you receive are in top condition. Some bulbs may not be as "pretty" as others, but will yield beautiful flowers in the spring. Please call us if you have any questions. Store the bulbs in a cool, dry spot (50°F to 70°F) with good air circulation and low humidity, away from heat, frost and strong sunlight. Poor storage conditions may cause bulbs to dry out, or to become moldy. They must be planted in the fall that you receive them. With few exceptions, all flower bulbs require the same sort of planting site: well-draining, neutral pH soil that is free of disease with at least six hours of daily sunlight. Tulip bulbs should be planted once the soil has cooled down to around 55°F (after about two weeks of sweater weather when the night time temperatures have consistently hovered in the 40s). Tulip bulbs do everything in response to soil temperature in the fall and winter, and to soil and ambient air temperature and sunlight in the spring. Planting Tulip bulbs too early, before the ground has really cooled down, can cause the bulbs to begin top growth rather than root growth, resulting in immature root development and diminished vitality. Tulip bulbs can be planted as the ground cools down further than 55°F. We’ve even planted them in January on an unusually warm day and they bloomed perfectly. Tulips are more forgiving than Narcissi in this regard. The best type of soil for flower bulbs is a sandy loam. It can be described as a balanced mixture of clay, sand, silt and a modicum of organic matter. Sandy loam usually is around neutral pH and affords good water drainage, root permeability and adequate nutrition. All flower bulbs require neutral pH soil (7.0) in order to grow roots. Less than 7.0 pH is acidic. Higher than 7.0 pH is alkaline. Acidic or alkaline soil prevents bulb root growth. Flower bulb planting sites (woodlands, display gardens or lawns) should be amended to neutral pH so that the bulbs may develop mature root systems. 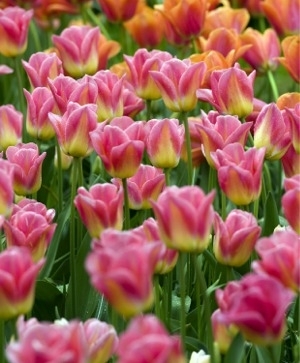 For detailed information on the best soil for Tulips, see Soil Good for Flower Bulbs. Since Tulip buds and flowers can be snack food for deer or marauding rabbits, you may want to plant them in a spot less likely to tempt them. If Tulip bulbs are planted along a road or driveway, they should be away from any plowed snow accumulation that may include road salt or other de-icing compounds harmful to bulbs. Tulip bulbs should be planted away from invasive tree and perennial root systems that can strangle bulb roots, compete for limited water and nutrition, and actually push bulbs up from the proper planting depth. As for all flower bulbs, Tulips hate to get wet feet. They should never be planted in areas with poor, excessive or continuous water drainage, or standing water. 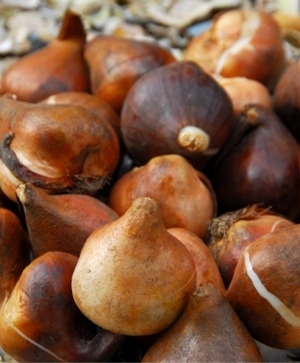 Moisture-ridden soil causes a healthy bulb to rot. If planted near a body of water, bulbs must be planted well above the high water mark. If planting along a stone wall, make sure that water drainage is away from the Tulip planting. 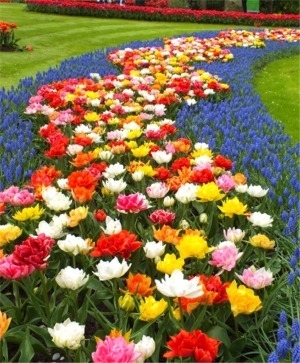 Tulips planted on inclines may sustain water damage as water drains and settles in pockets (planting holes) or in areas of continously draining water. Do not plant Tulip bulbs in previously diseased soil, particularly in areas where Peonies or other Tulip bulbs have developed botrytis blight, a soil and airborne fungal disease. This fungal disease can be detected by the appearance of foliage and/or flowers that have become disfigured or discolored. Dutch flower bulb growers, Dutch and American horticultural inspectors, our Dutch export colleagues and our own fastidious staff make sure that our Tulip bulbs are clean, healthy and free of fungal spores. Fungal diseases such as botrytis blight commonly develop in planting sites with overly cool and wet or humid conditions, overcrowding or inadequate maintenance. To avoid fungal disease, maintain good garden maintenance by dead-heading and discarding spent flowers and yellowed foliage, allowing proper space between plants, ensuring good air circulation and maintaining good water drainage. botrytis blight overwinters in dead leaves and stems, and infects soil. See below for more information about botrytis blight from the Missouri Botanical Garden. Never use top dressings of mint compost, horse manure, chicken droppings, mushroom compost, other hot manure, garden compost, household compost or commercial soil amendments for flower bulb planting holes or beds. They are not usually neutral pH. These top dressings or soil additives may create acidic or alkaline pH levels that prevent or retard root growth, and can actually rot the bulbs themselves. What is good for carrots, peas and tomatoes is not necessarily good for flower bulbs. Take care to make sure household compost is thoroughly decomposed and neutral pH. Garden and household compost often fail to decompose fully due to insufficient heat generation, and can be a breeding ground for damaging fungus and weeds. Most Tulips stage their best performance the first spring after fall planting. Tulips are not true perennials although there are exceptions: Species Tulips, Kaufmanniana Hybrids, Greigiis and Giant Darwin Hybrids. Tulips from these classes may come back for repeat years if they are happy where planted and never disturbed. To promote perennial performance, plant them in the fall according to the instructions (some people plant them 2" deeper than specified). Dead-head the flowers when they start to die back. Allow the foliage to thrive and die back naturally. Top-dress the bed with a 4-10-6 or 5-10-5 granular organic fertilizer three times a year: in the fall, the early spring and in late spring. Never cut stems for bouquets: plant a separate cutting garden. Some people choose to remove and replant their Tulip bulbs every year. Others choose to hold out for two years, or even three. You know you have to plant new Tulip bulbs when you start to see only foliage and no flowers. 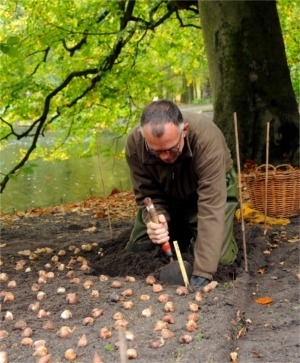 Planting Tulip Bulbs: Depth, Spacing and Which-End-Is-Up? Check the planting instructions and plant each bulb to at least the proper depth. It is a good idea to dig 2" to 3" below the planting depth to loosen the soil to promote thorough root growth and good water drainage. The spacing between Tulips is not quite as important as it is for naturalizing Narcissi. Many people plant Tulip bulbs a bit closer than 6" for an even more spectacular show. 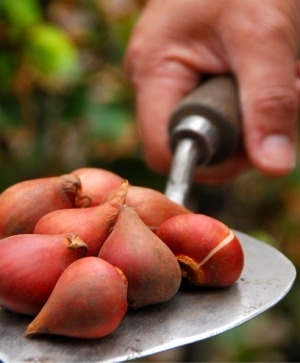 Place each bulb firmly in the soil with the pointed end up, and the basal plate, or root base, down. The general rule of thumb is to cover the top of each Tulip bulb with 3" to 4" of soil, taking care to not break off any sprout growth. The existence or amount of top growth varies by variety. Never put anything in the bottom of each planting hole. This is the best way to avoid the possibility of root burn, particularly since there is no incremental gain in doing so. The truth is that the Tulip bulbs you receive from us are perfect little packages that contain everything they need for glorious blooms the following spring. Just make sure to plant according to instructions. If you intend to grow Tulips on for a second year or more, it would help to top dress Tulip plantings with a 4-10-6 or 5-10-5 organic granular fertilizer three times a year. To top dress means to broadcast the fertilizer like one would cast birdseed, at the rate of about one teaspoon per bulb. First, top dress the fertilizer in the fall to promote root growth. Second, fertilize in the spring when the sprouts emerge to help grow the foliage and flower, and third, when the flower starts to die back to help nourish the bulb itself. If there is a prolonged dry period after fertilizing, you may water it in lightly. Bone meal is not recommended because it can attract animals and it is incomplete nutritionally. (The 4-10-6 fertilizer composition refers to 4 parts nitrogen, 10 parts phosphorus and 6 parts potassium.) Avoid root burn by never adding anything to the planting holes. One should apply no more than a 2" layer of mulch only after the surface of the ground freezes. The mulch is intended to trap the cold in the soil~not the warmth, to retain moderate soil moisture and to protect the bulbs from temperature spiking. Some good mulching mediums include straw, salt marsh hay or oak leaves. The mulch should be loosened or removed prior to sprout emergence in the spring. Tulip bulbs should never be planted in outdoor containers, window boxes or raised beds where they experience temperature spiking and repeat cycles of freezing and thawing. This results in root growth failure, root system destruction, frozen bulbs and/or bulb rot from poor water drainage. Tulip bulbs must have a consistent cold winter temperature with good water drainage in order to produce a mature root system that will permit foliage growth and flower production in the spring. Having said this, there are some clients in the Seattle area that swear by their success in planting flower bulbs in window boxes and outside containers. This might work in their particular micro-climate 9 years out of 10, but in any one year, temperature spiking could cause across-the-board failure. The bloom time listed for each variety is for horticultural zone 5 in "normal" spring conditions. The warmer the horticultural zone, the earlier Tulips will bloom in the spring. The colder the horticultural zone, the later Tulips will bloom in the spring. Flower bulbs do everything in response to temperature, sunlight and site conditions. Bloom times, heights and colors are approximations affected by these conditions regardless of the calendar date. If it is a warm spring, bulbs will bloom earlier. If it is a cold spring, bulbs will bloom later. If it is a long cool spring, followed by rapid warming, you may find odd bedfellows: earlier blooming flower bulbs flowering right along side later blooming varieties. Each spring can offer a different sort of garden surprise party. If a killing night frost is predicted, don't worry about your flower bulbs if top growth has appeared but the bud has not yet emerged: the worst thing that could happen would be some brown tipped foliage. If the bud has set and emerged, consider covering the bed with a floating row cover or light weight sheet. Don't forget to remove it in the morning. In the event of a somewhat 'normal' spring interrupted with an abrupt heat spike, Tulips with emergent stalks and set buds may bloom early, small and short, although they will likely grow taller and larger as long as temperatures moderate. 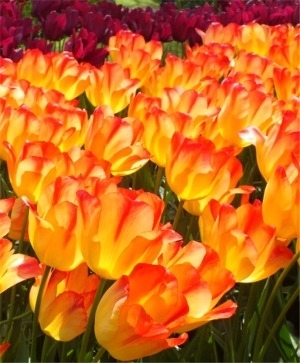 Tulips do everything in response to ambient temperatures and sunlight. In the event of an abnormally mild winter, particularly in horticultural zones 5b through 7b, root systems may be underdeveloped and plant size may be smaller due to an immature root structure. Temperature spikes can also affect mature root development, the actual form of the flower and, particularly for Tulips, the actual color. 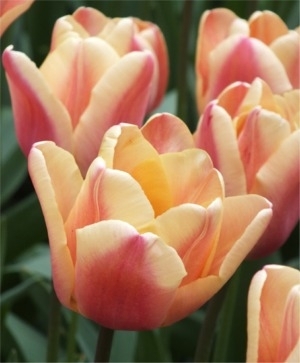 For example, Triumph Tulip Apricot Foxx is a warm, suffuse buttery caramel-apricot color in a normal or slightly warm spring while in a prolonged cool spring, its color intensifies into a a more high contrast apricot-raspberry bicolor. Triumph Tulip Sanne is different every time we see it, depending on spring temperatures from year to year. There are some Tulips that naturally change color over the duration of their bloom time. 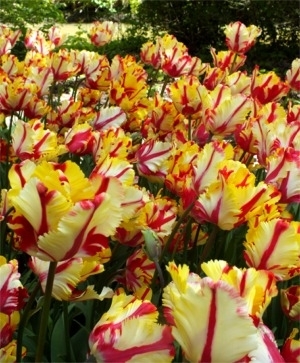 Parrot Tulip Flaming Parrot opens red and yellow and matures to bright white and red. 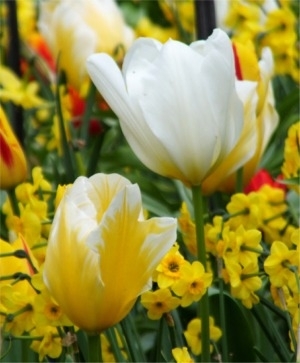 Single Late Tulip Shirley opens red and yellow and matures to bright white and purple. 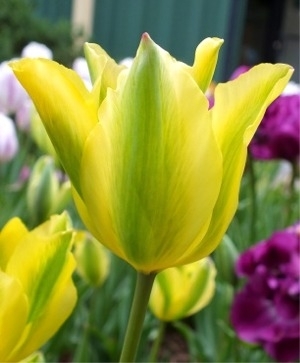 Giant Darwin Hybrid Tulip Cream Jewel opens yellow and matures to ivory. Giant Darwin Hybrid Tulip Pink Impression opens dreamy, soft old rose and matures to intense neyron-rose. Giant Darwin Hybrid Tulip Daydream looks different every day. 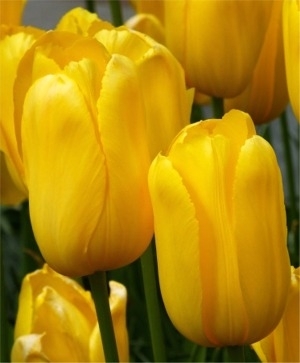 Single Late Tulip Maureen opens with a pale yellow glow or faint flames and matures to bright white. There are yet other varieties that have tremendous variation from bulb to bulb, creating their own kind of blended look. 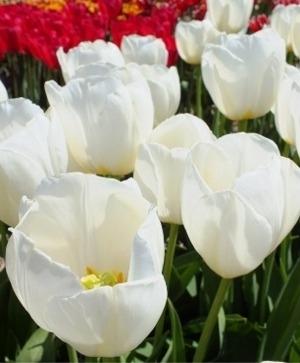 Emperor Tulip Flaming Purissima has flowers that range from pure white, to white with pale raspberry flames or deep raspberry flames, to raspberry with white striations. Giant Darwin Hybrid Tulips Gudoshnik and Silverstream are also magicians. They range from yellow to red, with every combination in between. 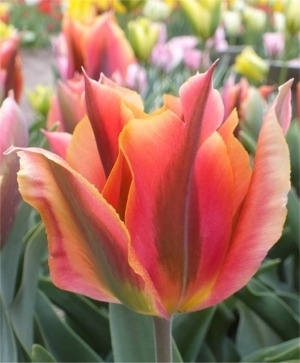 Single Late Tulip Rhapsody of Smiles similarly has tremendous color variation from Tulip to Tulip, appearing like a suffuse blend of yellow and red. In general, Tulips can appear different colors depending on the time of day, the brightness or dimness of the sun and if they have been forced. If we fall in love with a forced Tulip at the Breezand Lentetuin flower show, we always wait until we see it in the bulb fields before our final assessment. It can look completely different. When a camera enters into the color equation, there are even more variables, as each camera or cell phone slightly changes its representation of color depending on the time of day, amount of sunlight, intensity or saturation of Tulip color, and other colors around the Tulip. In addition to providing the greatest rainbow of colors, some Tulips are also fragrant. Double Early Tulips and Peony Flowering Tulips are known as the most fragrant classes of Tulips. But there are other individual varieties of Tulips that offer a sweet scent as well such as Emperor Tulip White Emperor; Single Early Tulips Couleur Cardinal and Keizerskroon; Triumph Tulips Annie Schilder, Apricot Beauty, Bastogne and Salmon Pearl; Giant Darwin Hybrid Tulips Akebono, Daydream, Holland's Glory, Lightning Sun and Silverstream; Parrot Tulip Apricot Parrot; and Lily Flowering Tulips Ballerina. 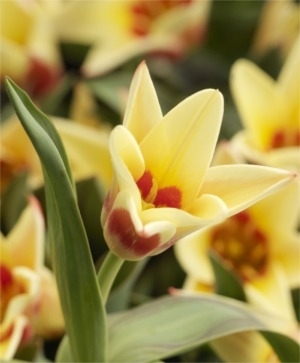 Fragrant Tulips offer a light sweet scent, pale in comparison to Oriental Lilies. Generally, cooler weather inhibits fragrance, while warmer weather incites fragrance. Before the Tulip sprouts emerge, loosen or remove any mulch. As the sprouts first poke through the soil, broadcast a light top dressing of a granular, organic 4-10-6 fertilizer on top of the soil. You may lightly water it in if rain is not forecast. This will help to grow the foliage and flowers. Enjoy every moment of Tulip blooms in the spring, for it will be a whole year before you can luxuriate in their beauty and spirit again. Tulips are the Art and Soul of Spring. When the flowers start to die back, broadcast another light top dressing of a granular, organic 4-10-6 fertilizer to help grow the bulb itself. After the flowers die, dead-head them an inch or two under the flower, if possible, to avoid the development of an unnecessary seed pod in the neck of the stem. Discard the felled cuttings to promote garden health free of fungal disease. If you intend to grow the Tulips on for another year, allow the stem and foliage to thrive unfettered for six to eight weeks, until they die back naturally, for maximum photosynthesis and chlorophyll production that nourishes the bulb. Do not braid foliage, have other plant material grow to cover the foliage or allow it to be mowed down prematurely. Insufficient photosynthesis results in malnourished bulbs that will fail to thrive. Once the foliage has yellowed- or browned-out, it is dead. Then, it may be raked up and discarded to promote garden health. 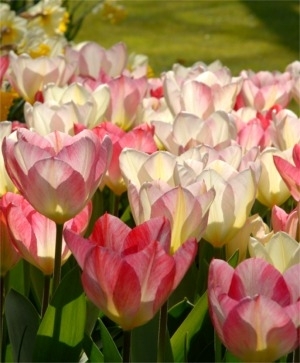 If you intend to cut Tulips for bouquets, you should plant a separate cutting garden, rather than cutting display Tulips. Cutting Tulip stems destroys the vitality of the bulb for even a hope of subsequent year blooms. Tulip Tip: Once cut and placed in water, Tulips keep growing taller, so plan your arrangements to account for the growth of the Tulips. Some designers incorporate branchy stems to support the Tulips. You may also cut the Tulips as they grow, and refresh the water. The Tulips that you grow yourself for bouquets and arrangements will be larger and significantly more impressive than any Tulips you could ever buy, even from the finest of florists. 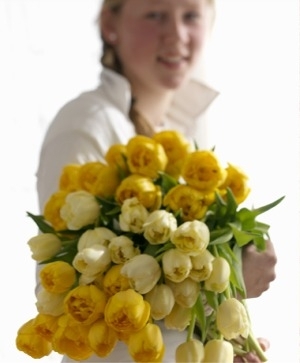 Never mix Tulips with Narcissi in arrangements: Narcissus stems secrete a viscous substance that clogs up Tulip stems and prevents water absorption. If you've selected flower bulbs that are not known to do well in your horticultural zone. Specify your order for prechilling and we will ship your order for receipt in mid-October so that you may begin the prechilling process. Mid-October is the best time to start prechilling Tulip bulbs. When you receive your order, open and examine the bulbs to make sure they are firm and healthy. If any of your bulbs have a blue-gray "transportation" mold, remove it with a paper towel or put the bulbs in a single layer in the sun for an afternoon. If any bulbs are soft, please discard them and do not prechill them with your other bulbs. Before you remove the bulbs from the cooling unit, prepare the garden bed for planting. Select areas of partial or dappled sunlight to protect the flowers and foliage from excessive sun and heat, and to prolong the spring bloom period. When you are ready to plant, remove the bulbs from refrigeration, place them out of direct sunlight and plant immediately. Do not remove the bulbs from refrigeration until you are ready to plant them, since this compromises the benefit of the prechilling process. Never plant flower bulbs shallowly; plant them at least as deep as specified in our planting instructions. Once planted, apply a light 2" layer of mulch to help retain moisture and trap cool temperatures in the soil. Make sure to water the flower bulb beds occasionally if rainfall is insufficient. Precooled Tulip bulbs should be considered as annuals. That could be a good thing since you do not have to allow the foliage to die back naturally. The bulbs may be lifted and discarded immediately after the flowers fade. *Species Tulips acuminata, bakeri Lilac Wonder, batalinii Bright Gem, batalinii Salmon Gem, biflora, clusiana Cynthia, clusiana Lady Jane, clusiana var. chrysantha, clusiana var. chrysantha Tubergen’s Gem, dasystemon, humilis alba coerulea oculata, humilis Eastern Star, humilis Persian Pearl, humilis violacea, The T. humilis Mixture, kolpakowskiana, linifolia, Little Beauty, Little Princess, orphanidea flava, Peppermint Stick, praestans Fuselier, saxatilis, sylvestris, turkestanica, vvedenskyi Tangerine Beauty and the Species Tulip Mixture. *Double Early Tulip Monte Carlo. *Parrot Tulips Blue Parrot and Flaming Parrot. *Single Late Tulips Avignon, Camargue, Dordogne, Francoise, La Courtine, Maureen, Menton, Menton Exotic, Queen of the Night and Renown. Botrytis blight is a fungal disease to which Tulips and Herbaceous Peonies are susceptible. This fungal disease is not present within or on the Dutch Tulip bulbs that we ship across the United States. 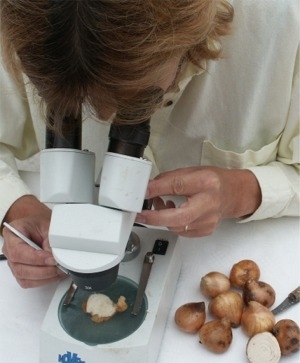 Dutch and American agricultural inspectors fastiodiously examine the fields, blooming Tulips and bulbs during and after harvest and prior to export shipment to make sure that they are free of botrytis blight. Rather, it is a soil, water and airborne fungal disease that develops in planting sites here due to overcrowding, humidity and poor air circulation and dead, rotting plant material that is not removed from the planting site. We have taken the liberty of reposting information about botrytis blight from the Missouri Botanical Garden. "Botrytis blight, also know as gray mold, is a fungal disease caused by several species in the genus boytrytis. It affects the buds, flowers, leaves, and bulbs of many plants including: African violet, begonia, chrysanthemum, cyclamen, dahlia, geranium, lily, peony, rose, and tulip. The extent and severity depends on weather conditions and cultural practices. This disease is the primary cause of decay in cut flowers. Botrytis blight causes buds and flowers to develop abnormally and turn brown. Flowers may have irregular flecks and brown spots; older flowers tend to rot quickly. Soft, brown spots appear on leaves, stem, and flowers following a cool damp period. Affected parts may be covered with a gray mold following damp, cool weather. Botrytis fungi overwinter as sclerotia on dead plant debris in the garden. In the spring, spores form and spread by wind or splashing water to infect dying, wounded, or extremely soft plant tissues. Fungal mycelial strands (web blight) from previously infected plant parts can grow onto healthy plant parts and infect them. The fungus is capable of invading tissue during all periods of the growing season and multiplies rapidly in declining foliage, hence the need for good sanitation." Remove and destroy all infected plant parts as soon as they are observed. Give adequate space between plants to allow for good air circulation. The fungus thrives in areas that are cool and moist and where plants are overcrowded. Avoid fertilizing with excessive amounts of nitrogen. This can cause tender growth that is very susceptible to the fungus. Get a soil test to guide fertilizer practices. Water on foliage and flowers from overhead irrigation, especially on cool, cloudy days, promotes the disease. Try to keep buds and flowers dry. Water early in the day so the plants have enough time to dry off completely. Depending upon the susceptibility of the plant to this disease, spray every 10 days with a fungicide. Pesticides registered for use include copper (1), captan (2), chlorothalonil (3), (Daconil), mancozeb, maneb, sulfur (4), and thiophanate methyl (Cleary 3336). Fungicides must be applied in advance of the disease as a protectant. Strategies 1, 2, 3, and 4 (if organic fertilizers are used) are organic approaches. Of the fungicides listed in Strategy 5, consult the Organic Materials Review Institute (https://www.omri.org/home) for appropriate organic copper or sulfur products.